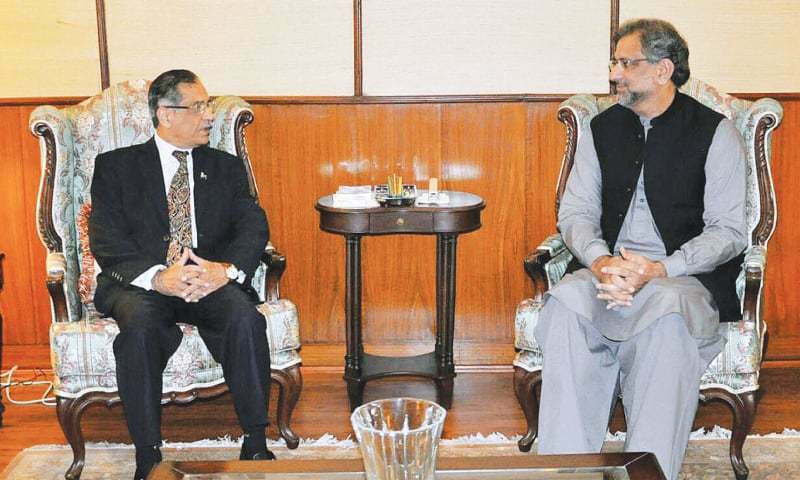 ISLAMABAD: In a surprise move amid heightened tensions between the ruling party and the judiciary, Prime Minister Shahid Khaqan Abbasi dashed to the Supreme Court to have his first one-on-one meeting with Chief Justice of Pakistan Mian Saqib Nisar on Tuesday evening. The unexpected meeting between the heads of the two institutions which continued for hours may help in defusing the perceived tension between the ruling Pakistan Muslim League-Nawaz and the judiciary and in lowering political temperature especially against the backdrop of criticism of the judiciary by former prime minister Nawaz Sharif, his daughter Maryam Nawaz and other relatives facing corruption charges in an accountability court, legal observers believe. Analysts see the move as part of an effort by the prime minister to convince the judiciary that the PML-N government does not want to confront it and to communicate the difficulties the government faces due to judiciary’s active role in questioning the quality of governance. The initiative came against the backdrop of Mr Abbasi’s recent interview to a private TV channel in which he said that his government was ready to initiate a dialogue with any institution. The same offer had been extended by Mr Sharif while talking to the media outside the accountability court where he had come to face corruption references against him. The meeting was not unprecedented as a similar interaction took place between the then prime minister Yousuf Raza Gilani and the former chief justice Iftikhar Chaudhry in February 2010 at the height of tension on the appointment of judges. A three-hour-long follow-up meeting was held over a dinner the next evening. Meanwhile, an official handout issued by the Supreme Court said the meeting was arranged on the prime minister’s request received through Attorney General Ashtar Ausaf. It was held in a cordial atmosphere in the chambers of the chief justice. The handout stated the prime minister showed keen interest in providing all possible assistance in revamping the judicial system as visualised by the chief justice. The prime minister assured the CJP that the government would provide all resources to the judiciary in order to enable it to provide speedy and inexpensive justice in addition to facilitating easy access of justice to the people. The prime minister also highlighted the difficulties of the Federal Board of Revenue and the tax department due to litigation involving revenue in different courts. The chief justice assured the prime minister that he would look into the matter and such litigation would be fast-tracked. The prime minister pledged full support for public interest litigation initiatives undertaken by the chief justice. He assured that all steps would be taken to materialise the CJP’s vision with respect to free education, public health, improvements in government hospitals and provision of quality and affordable health services, revamping medical education especially in private medical colleges, provision of clean drinking water, better sanitation and protection of environment etc. According to the Supreme Court’s handout, Mr Abbasi also told the CJP that the Council of Common Interest (CCI) had approved National Water Policy (NWP) that would help in fruition of the chief justice’s efforts in that direction. Oddly enough, the CCI meeting had earlier during the day decided that the proposed NWP would be brought in the next CCI meeting after incorporating suggestions from provinces for its final approval. CJP Nisar assured the prime minister that the judiciary would continue to perform its constitutional duties independently, fairly, transparently, without fear or favour and strictly in accordance with law. Meanwhile, a source in the PM Office told Dawn it was not a planned meeting since no one in the PM Office was aware of the prime minister’s plan to meet the CJP. The prime minister went to the Supreme Court in a private car without his protocol. He was sitting on the back seat of a black colour BMW SUV (bearing registration No: EZ-990). He was accompanied by the chief security officer, a driver and an official of the PM office. He reached the Supreme Court premises at about7pm and the meeting last for two hours till 9pm. A senior counsel on condition of anonymity said the prime minister was already indebted in view of the recent rejection of a case by the Supreme Court in which Awami Muslim League chief Sheikh Rashid Ahmed had sought disqualification of the prime minister under Article 62 and 63 of the Constitution by declaring the LNG contracts illegal and unlawful. “Everybody was thinking that the petition may bring problems for the prime minister but the Supreme Court took a traditional view by giving a clear message that the judiciary did not want removal of another prime minister before the general election which was round the corner,” he said. However, Pakistan Tehreek-i-Insaf’s spokesman Fawad Chaudhry said his party would never accept any NRO-like understanding to allow Mr Sharif to flee the country. He claimed that the PTI knew in advance about the meeting. “We believe that the statement on part of the prime minister offering dialogues with institutions is unusual,” he said and questioned the timing of the meeting between the prime minister and the chief justice. Vice Chairman of Pakistan Bar Council (PBC) Kamran Murtaza said he could only guess that the prime minister must have raised some grievances the government was facing because of court observations. Former PBC vice chairman Azam Nazeer Tarar appreciated the meeting between the heads of the two institution and termed it a good omen for the continuity of the democratic setup and the Constitution especially against the backdrop of different conspiracies making rounds. Another senior counsel who wished not to be named, however, stated that the issue of delimitation of constituencies on a provision result of the census must have also been discussed since it was expected that petitions may land in the court seeking to prolong the interim government that would soon be set up to oversee the upcoming general election.